Dazzle your Valentine with a lovely gift box of miniature layer cakes dipped in chocolate. Petits fours make excellent gifts for Valentine's Day or any other loving occasion. Surprise your Valentine with our special demitasse "petits fours gram". 36 moist bite-sized layer cakes adorned with a rainbow of chocolate hearts and a hint of amour. Each of the petit fours is filled, dipped in real chocolate, and decorated by hand. Packaged in a handsome gift box, this assortment includes: Raspberry Creme, Bittersweet Chocolate Cherry, Very Berry Strawberry and Triple Truffle. 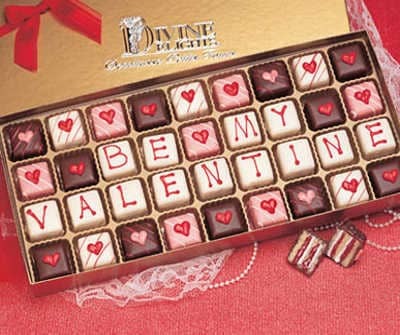 With 36 petits fours in each box, there's plenty for you and your Valentine to share. Where does the word "petit fours" come from? Petit fours are tiny cakes baked during the cooling phase of old ovens from 19th century Europe - the lower heat (as opposed to the high heat "grand four") setting was called "petit four", literally "small oven." Once extremely popular at French tea parties, petit fours are making a comeback as birthday gifts and gourmet desserts.